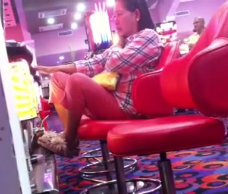 Torres, clad in checkered blouse, pink leggings, and rubber shoes, can be seen in the clip resting her legs in the lower part of the machine. The uploader of the video did not provide any details about Torres’ stay in the casino. If the clip was taken during her tenure as LTO chief, Torres may be held liable for violating Memorandum Circular 20, series of 1986. MC 20 mandates that “government officials connected directly with the operation of the government or any of its agencies” are not allowed to play at the gambling casinos. The memorandum was signed during the term of President Benigno Aquino III’s mother, former President Corazon Aquino. This entry was posted on Wednesday, August 14th, 2013 at 8:51 pm	and tagged with lto chief casino, lto chief caught gambling, lto chief huli sa video nagsusugal, virginia torres casino, virginia torres caught on video, virginia torres gambling, virginia torres lto chief, virginia torres noynoy aquino and posted in journalism, philippines, politics. You can follow any responses to this entry through the RSS 2.0 feed. as public official, she is prohibited in going to casino. if she wants to play specially her own money, quit the government. unfair naman un, d ka pde mag casino pag taga gobyerno , bakit masama kung pera mo naman un ginagamit mo at gusto mo lang mag relax, un nga iba jan mas grabe pa .. sana naman maging fair kau ….playing slot is 1 way of releasing stress…. Oh My Buhay is an online journal written by Ms. Annie Tan-Yee whose life’s experiences are indeed entertaining and awe-inspiring.